Plus, in related non-tortoise news, the BLM gave the green light for Bechtel to resume the next phase of construction at BrightSource’s Ivanpah CSP site. The Bureau of Land Management (BLM) just issued a Notice to Proceed for BrightSource Energy's Ivanpah Solar Project, allowing the project's EPC, Bechtel, to resume the stalled next phase of construction at Ivanpah. The project remains on schedule, according to the company. Ivanpah sites II and III had received a temporary suspension on April 15. The Ivanpah plant, slated for completion in 2013, has been the target of legal action from an environmental group despite approval of the project by both the Department of the Interior and the state of California. To mollify some objections, BrightSource scaled down the size of the project as part of the environmental mitigation process. BrightSource has had to mitigate their environmental footprint to contend with the desert tortoise by avoiding long-term impacts to 433 acres of habitat, as well as acquiring additional land off the Ivanpah site for tortoise relocation within their home range. The 433 acres of habitat on the site and the additional mitigation land would remain available to tortoises for foraging, cover, and other lifecycle requirements. While it is unknown how many tortoises would be in this area at the time of construction, three of the 20 live tortoises observed within the project boundary during the 2007 and 2008 surveys would be avoided, resulting in the need to relocate about 15 percent fewer tortoises. At a minimum, 17 existing burrows in this area would also be preserved. Here's a link to a Biological Mitigation Document involving desert tortoises, rare plants, soil, and visual impact. BrightSource has spent "a surprising amount of money" for tortoise mitigation, according to Bechtel -- the firm has to buy mitigation land whether they find a tortoise or not. BrightSource also has to monitor each tortoise for five years and perform a blood analysis to check for respiratory diseases. BrightSource has up to 100 biologists working at the Ivanpah site (!). Ivanpah has 500 workers on site, including biologists and trade workers from California’s High Desert. The project will create an estimated 1,000 union jobs at the peak of construction. The Mojave Desert spans 20 million acres of land across four states and is home to the desert tortoise, a federally listed “threatened” species. 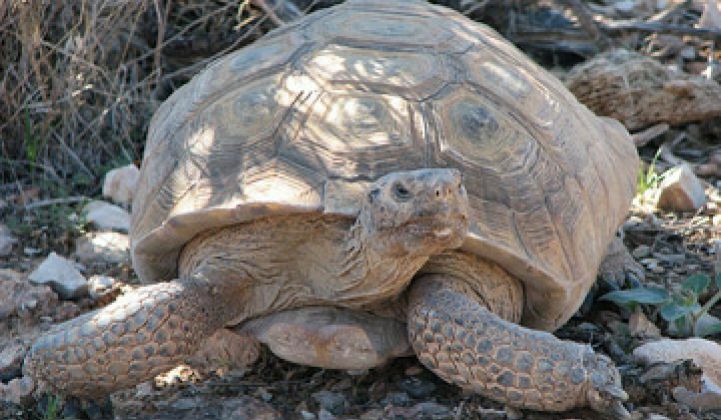 To help rebuild the desert tortoise population in the Ivanpah Valley, BrightSource has started a "head start" program at the Ivanpah project site to prevent juvenile tortoise mortality. Head-start programs provide support and protection for hatchling and juvenile tortoises during the first five years of life, or until they are large enough to resist predators. In addition to moving the desert tortoise out of harm’s way, the head-start program is enabling tortoises to be hatched within a protected area, watched over to ensure they are more likely to survive, and ultimately released into their natural environment. More details about the heroic measures being taken to keep this threatened species afloat are here.